The journey for this diminutive species started in August 2014. My friend Pat had found some sampling report for the Enneacanthus species in New Jersey. On our first try at this tannic lake, we were all successful in finding Bluespotted Sunfish (Enneacanthus gloriosus), Banded Sunfish (Enneacanthus obesus) and Mud Sunfish (Acantharchus pomotis). The only one that we failed to locate was the Blackbanded Sunfish (Enneacanthus chaetodon). We probed a lot of varying habitats, but these small fish were simply too elusive. Three weeks later, I was back in New Jersey with my friends Eli and Michael. With limited time, we fished the same lake for just a few hours. I concentrated most of my efforts on the Blackbanded Sunfish. However, I did not even see one on this cloudy day. It became much harder to locate these fish in the fading light and the mission was a complete failure. This species kept tugging at my heart strings. Two more weeks passed until I found myself in New Jersey again. This time, my friend Elijah and I spent the morning on a party boat trip (fishing for Atlantic Bonito) before fishing the lake. I had only a little over 2 hours to find Blackbanded Sunfish before we had to rush to New York for my bus ride home. With less than a few minutes left to the session, I finally sighted the first Blackbanded Sunfish. In fact, once I understood where these fish could be found, I saw close to a dozen of them before we had to leave. On the last few attempts of the day, I had one Blackbanded Sunfish pecked at the baited hook but it did not committed enough to hook the fish. Around June 2015, my friend George suggested that we should take a weekend trip to the US for a species hunt. He has yet to catch any of the micro sunfish (our pet name for the Enneacanthus species) or any of the inshore micros. So a plan was made to fish the lake at least one afternoon and one morning. This would be the greatest effort yet put forth toward the Blackbanded Sunfish. After driving the whole day, we arrived just before 5pm. While George was taking his time to rig up, I was very anxious to start. However, I did want to give George proper instruction so he could catch his lifer Bluespotted, Banded and Mud Sunfish. Once George was on his merry way on his own hunt, I started searching for the right habitat for Blackbanded Sunfish. 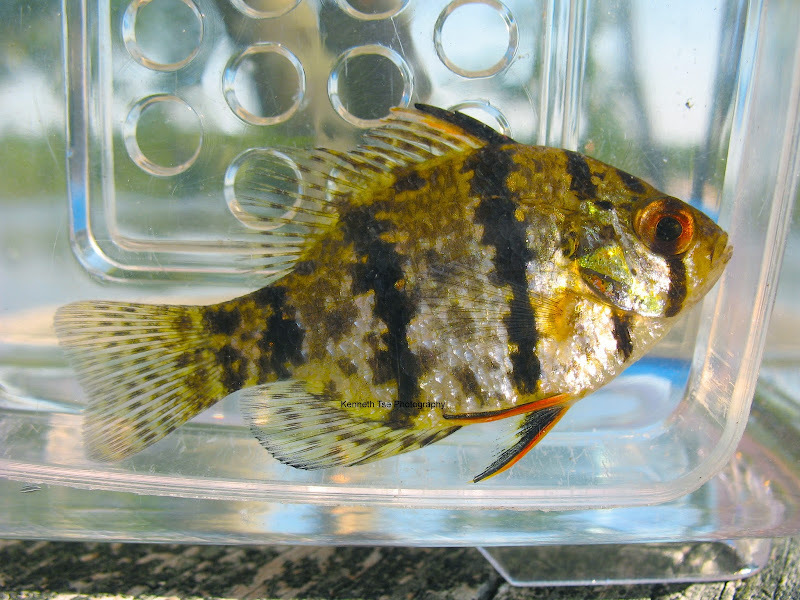 Whereas the Bluespotted, Banded and Mud Sunfish could be found very tight to the margin of the shoreline, Blackbanded Sunfish prefers openings in the dense weeds. Soon enough, I found a few hovering in and out of the weed cover. I was using a tenkara rod with a tanago hook and a tiny fleck of worm. A couple of tiny splitshots were placed about an inch from the hook. While the Blackbanded Sunfish often darted over to examine the bait, they only peck at the bait at the best of time. After trying similar areas and being refused by these little fish over and over again, I knew something was not right with my presentation. I noticed that these fish are most curious and they would rush over as I lower the rig. However, when the rig was held in place, they would quickly darted away. It appeared that, even with my greatest effort, I simply could not hold the bait still. The fine tip of the tenkara rod amplified any little vibration into a constant jiggle. The jiggle was the factor that turned off the fish. Since the jiggling splitshots were most offensive to the fish, it has to be eliminated from the presentation. However, without the splitshots to anchor the line straight, any slight wind or air current could blow the line around to lift and move the baited hook around. Putting a bit more thought into the problem, I decided to move the splitshots 8" from the tanago hook. This way, the baited hook is far enough from the jiggling splitshot, yet close enough to anchor the line tight and to keep the bait in the water. It was as if a spell had been lifted. As I tried to keep the splitshots close to the surface and out of sight, the baited tanago hook sank naturally. The Blackbanded Sunfish quickly became entranced by the falling bait and started pecking at it. The first two were more cautious and they would spat the bait before I could set the line tight. However, a third fish finally swam over quickly and swallowed the entire offering. As I lifted the rod, a little vibration from the tip of the rod signaled the fish had been hooked. Yet, before getting ahead of myself, I knew getting the fish to shore is most difficult. These little micro had a knack for wriggling off the hook as the fish broke surface or as the fish struggled on the line in the air. Before I could get the fish into my photo tank, I did not get too excited. Finally, I had the fish in the safety of the micro tank and I quick look revealed the prominent black bands on this little fish. I let out a yell so loud that George knew I had accomplished the feat. It certainly was no small task, and one I felt quite accomplished; since among all the species hunters I know, there was only one other person who had caught a Blackbanded Sunfish. This was no small feat. Lesson #474 - A micro species may refuse a baited hook not because of its attractive quality; rather, the jiggling splitshot placed too close to the hook is the offensive object spooking the fish. The following day, I would catch one more Blackbanded Sunfish while searching the margins for a photo quality Banded Sunfish. At the very end of our fishing session at the lake, George was unable to find a Mud Sunfish. With a few minutes remaining, I convinced George to give them Blackbanded Sunfish a try. Finding the right area and a few fish, George quickly caught one with my guidance. With three fish caught in less than 24 hours time, I can safely say we have this species of Enneacanthus patterned now.